FitCentric® Technologies is about to display the latest and greatest of PC-interactive cycling training technology at Interbike! NetAthlon 2.0, the new version of virtual training software featuring awesome graphics, great crashes, new courses, enhanced Web Racing for racing and training sessions of up to 25 riders on-screen at a time (the peloton has arrived! ), and more, see below. Online real-time coaching using FirstBeat RRI EPOC technology -- don't wait for coaching, get it while you ride. See details below. The Wireless retrofit for bike trainers -- convert a cheap trackstand into a PC interactive virtual trainer in minutes for less than $200. Capture speed, distance, cadence, and digital heart rate -- ALL WIRELESS and with NO watch. Data goes to the PC instantly for incredible performance of NetAthlon software. See details below. The show goes on -- Not only will NetAthlon® 2.0 be commercially available, but also the famous Alpe d'Huez 2004 Time Trial will be available to ride WIRELESSLY. Attendees will experience wireless retrofits that will work with simple bike trainers or roller trainers with embedded EPOC real-time coaching. This is FitCentric's most exciting InterBike to ever. FitCentric's wireless retrofit modules capture speed, distance, cadence, digital heart rate and soon provide steering interaction. To those familiar with NetAthlon 1.0 and its seamless integration with PC interactive cycling trainers and most gym-type fitness machines, this adapter system ends compatibility issues with all fitness machines. FitCentric's UltraCoach will be at Interbike with support for more HR devices -- Timex BodyLink, HACtronic, Suunto T6, and newer Polar watches as well as the "S" series. FitCentric's new NetAthlon 2.0 features incredible realism, a new user-friendly interface, and more courses. On-screen, the rider can see their "Firstbeat Training Effect" as well as other training data, their position on the course profile and course map. "The new display in letterbox mode makes NetAthlon intuitive," says Ken Burres MD, FitCentric CEO. "We responded to user suggestions and expect covered most of them." FitCentric® continues to lead the fitness software category with NA 2.0 defining PC-fitness machine interaction and features. Like other FitCentric software products, NA 2.0 offers the user (cyclist, runner, rower, climber, etc.) 3D real-time animated courses that fill the screen (LCD, CRT, TV, plasma, projector LCD, etc) with highly realistic and compelling content that supports fitness machine and trainer characteristics including crashing, steering, 3D headgear and wide-screen displays. Environmental sounds include animals, gear changes, breathing, etc. Soon, NetAthlon 2.0 will have embedded background music. 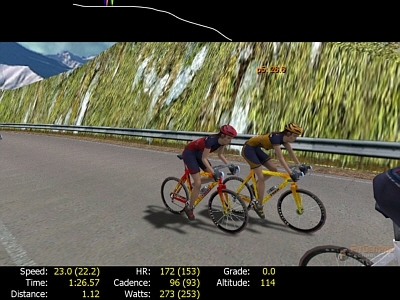 NetAthlon 1.0 supported eight on-screen for group training, but NA 2.0 supports up to 25 cyclists on-screen at one time encouraging larger group competitions online. FitCentric introduced Web Racing" in 1996 and with its partnership with GameSpy Arcade, has produced the largest number of online events. NA 2.0 makes the events more realistic. "NA 2.0 has other features our users will like. There is a new user interface that makes program setup and configuration changes simpler. Access to Web Racing has been simplified. The library of courses has been converted to the new format and enhanced with denser graphics, higher resolutions and more," says Ken Burres, FitCentric CEO. "The NetAthlon product will soon be extended to include NetAthlon Event Edition for networks and NetAthlon Club Edition for gyms and fitness centers. New courses are coming for the imminent winter season including Alpe d'Huez 2004 time trial, a South African two-ocean cycling course, and more." NetAthlon is the most comprehensive software application available for cycling trainers and fitness machines and continues to lead the industry for utility, realism, and featureset. It is the only software that integrates all PC interactive cycling trainers with a unified driver so training and competition will not be affected by mechanical differences and sessions are "on a level playing field." NA 2.0 integrates with UltraCoach 3.0, FitCentric's performance analysis software that is packaged FREE as UltraCoach Lite with NA 2.0. NA 2.0 supports Web Racing, FitCentric's online eventing utility -- simulating outdoor group riding and racing, and there are other features: cycling trainers that support steering and crashing will find greater realism while still permitting the cyclist to crash without actual physical injury! Character movements integrate with the courses just like outdoors, and all NA 1.0 courses have been reformatted adding lots of details and high resolution. FitCentric NA 2.0 has integrated online onscreen real-time PC-based cycling coaching. "We have been working with Firstbeat Technologies of Finland to bring the most innovative change in the virtual cycling and fitness experiences," offers Burres. "Most people wait until after they run, cycle, row, etc., to know if they have been improving their training effect. Then, they plan their next workout. Following an onscreen message icon for guidance, the user will know instantly if their training is effective and taking them to better fitness. They will get Training Effect messages 1 - 5." "The FirstBeat people have created EPOC, an embedded technology that does analysis in real-time while they are exercising," adds Paul Stewart, FitCentric CTO. "Using beat-to-beat (RRI) heart rate data capture, the embedded application works behind the scene to analyze data, but on-screen users get a simple helpful message! We are very excited about this technology as it will help recreational, school-level and competitive athletes with their fitness and weight reduction programs."